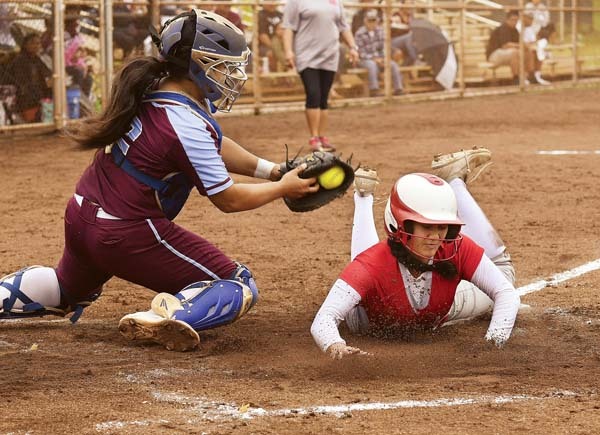 KAHULUI — The Baldwin High School softball team has not been to the state tournament since winning the Maui Interscholastic League Division I title in 2015. 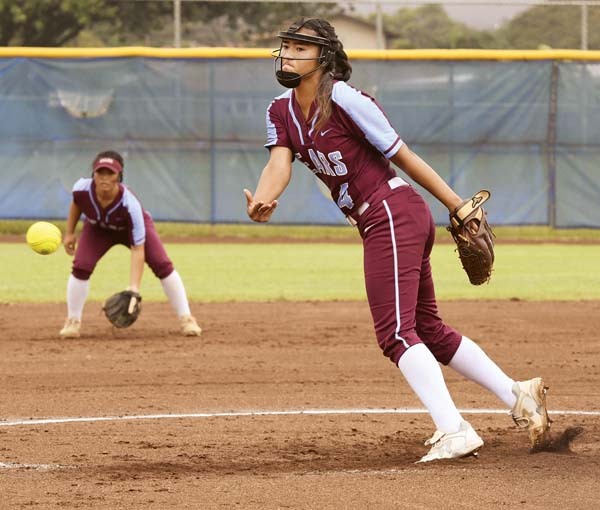 After a 7-3 win over Lahainaluna through the rain on Saturday at Patsy Mink Field, the Bears are on the verge of clinching a return to state. Baldwin is now 9-0 in the MIL Division I race after banging out eight hits, three of which were doubles, to back a six-hit, complete-game performance in the circle by Aliya Harmon. Harmon struck out three and walked six in a 148-pitch effort. Harmon surrendered a run in the first inning on a bases-loaded walk, but the Bears struck for two runs in the second inning on an RBI double by Jessica Ai and an RBI groundout by Jordyn Vierra. They wouldn’t trail again. After the Lunas tied the game on a sacrifice fly by Kaaina Kalanikau in the third, the Bears took the lead for good on a run-scoring fielder’s choice and a sacrifice fly by Saree-Ann Kekahuna in the bottom of the third. Kekahuna and Harmon have been battery mates since their youth softball days. The defending MIL champion Lunas (3-5) have just two seniors on the roster, but Baldwin coach Sanoe Kekahuna knew her team could not take the foot off the gas. Baldwin put the game out of reach with three runs on five hits in the sixth, including an RBI double by Sammy Martinez. 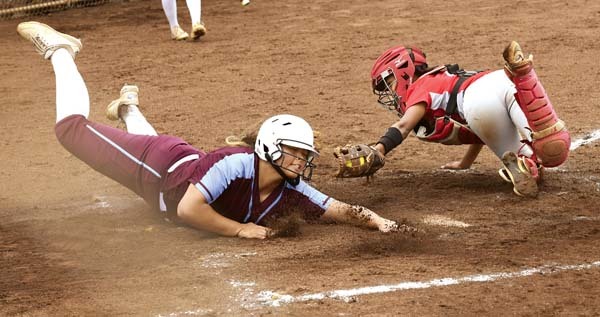 Lahainaluna scored its third run in the sixth on an RBI single by Keani Pagan and advanced the first two runners in the seventh to second and third bases with no outs. The Bears pulled off a double play to snuff out the threat when right fielder Shalei Awai caught a fly ball and threw out Daisha Dagdag at the plate. In the fifth, Vierra made a spectacular diving catch in left field to rob Dagdag of a hit. “Absolutely,” Lahainaluna coach Lei Nakamura said when asked if Baldwin is a tough team. Nakamura would not entertain the thought of blaming youth for the Lunas’ loss. Baldwin can clinch the regular-season title and the state berth that goes with it on Wednesday against second-place Kamehameha Maui. 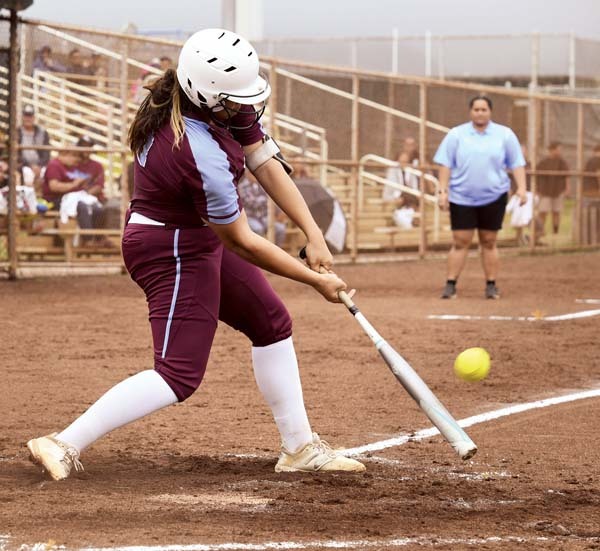 The Bears’ knack for timely hits has been keen lately, including a key home run by Avei Silifaiva in their recent win over King Kekaulike. Seraya Casco and Daisha Dagdag; Aliya Harmon and Saree-Ann Kekahuna. 2B–Lahainaluna: Mia Gerbig; Baldwin: Sammy Martinez, Jessica Ai, Kekahuna. Leading hitters–Lahainaluna: Dagdag 2-4. Baldwin: Sasha Tanoue-Kekona 2-2, 2 runs. Baldwin vs. Kamehameha Maui at Maui High, 4 p.m.
King Kekaulike at Lahainaluna, 6 p.m.
Hana at Lanai, 4 p.m.
Kamehameha Maui vs. Lahainaluna at Maui High, 6 p.m.